Parra are first onto the field and we are running north to Merrylands Rd. Fly half Sam Hayward sets up the tee for a kick to the Tatafu Pavilion corner. Matt Kellaghan is officiating. South’s take the ball cleanly and kick to full back Hayden Cole. Hayden puts up a deep quick but doesn’t find touch. Tatafu Pololta- Nau Pavilion erupts with discontent. “If you going to kick, at least kick it dead!” South’s run 50 metres and immediately put Parra under pressure. Fortunately South’s turn the ball over for a Parra scrum. The first penalty goes to Parra. We kick to the south west corner. Parra lineout on South’s 22metre. This is followed by a Parra scrum. Our strong scrum is like watching poetry in motion our pack puts South’s backwards. Parra spins the ball right. South’s force us back, however, Parra kicks out of trouble. Full back Hayden follows through and with a great tackle and forces a turnover in the centre of the field. Parra is unable to control the ball and South’s are awarded a scrum on half way. Parra is penalised for not releasing the player. South’s take the scrum and with quick hands come right and score between the posts. South’s kick is successful. Southern Districts 7, Parra 0 after 8 minutes. From the kick return South’s are held up for a Parra scrum on South’s 22 metre. Fly half Sam Hayward is crunched as he takes the ball forward. The play is stopped while Sam is treated for a head knock. Sam is replaced by Johnny Poe. Unfortunately for Sam we do have a registered Doctor present so Sam is no allowed to return to the game. 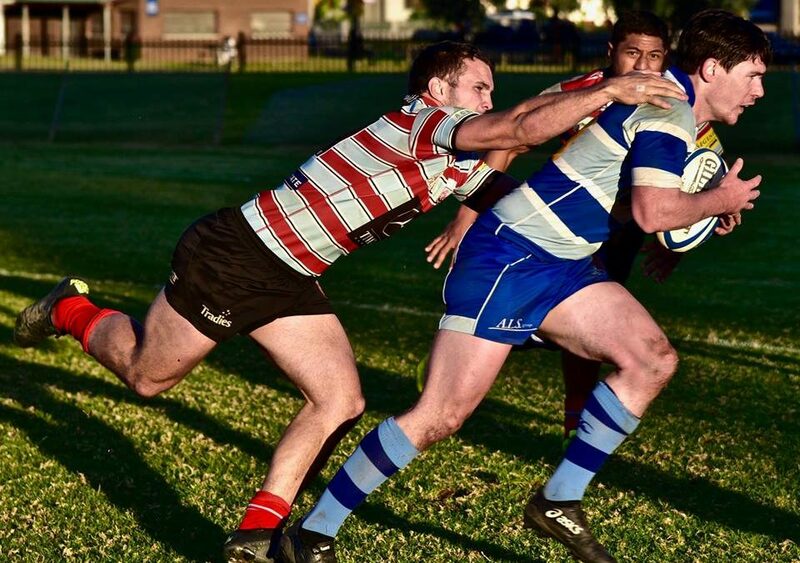 Fly half John Poe has played every grade today from 4ths to 1sts. Thanks John. A great clubman! My only concern is that John has no knowledge of the game plan as John puts up a deep kick. It doesn’t find touch. My worst nightmares are confirmed as South’s spread wide and run the ball to the club house south corner. South’s score between the posts even after a great ball and all tackle by flanker Adrian Musico. The conversion is successful. Southern Districts 14, Parra 0 after 16 minutes. Parra kick deep and South’s make 30 metres returning the ball. South’s lose control of the ball. Parra scrum on half way 5 metres in from the eastern sideline. Fly half John kicks deep. South’s take the ball on the fly and run down the side line leaving half Waldo Wessels in their wake as they exchange passes. Two tries 2 kicks and of course a few turn style tackles. There must be a message in that. “Kick the ball dead!” The conversion is unsuccessful. Southern Districts 19, Parra 0 after 20 minutes. Both sides are playing well. It’s just Parra’s simple errors that gives the opposition good field position or puts the team under pressure. The next try is a cracker as South are penalised for holding on. Fly half John kicks to the north eastern corner. Parra lineout. Parra bring the ball down and after 5 phases of play half Waldo combines with fly half John who puts flanker Adrian Musico into the gap who then and then unloads to flanker Dan Tamone. Dan scores a great try between the posts. Wing Joey Leatigaga converts. Southern Districts 19, Parra 7. A brilliant structured try after 24 minutes of play. We are back in the game. When I get excited watching the game the team gets punished by the rugby gods. South’s lineout on our 30 metre on the eastern sideline. South’s spread right with quick hands and score in the south western corner. The conversion is successful. Southern Districts 26, Parra 7. We can’t get into the game with any consistency as we lose our own lineout with a long ball. Our backs are up flat as South’s spread right to score. The conversion is successful. Southern Districts 33, Parra 7. To Parra’s credit we lift and after 5 phases of play Parra receive a penalty for South’s not releasing. Parra kicks to the north eastern corner. From the line out Parra bring the ball down into a rolling maul. South’s hold the Parra player up. South’s scrum 5 metres from their line. South’s kick for touch. Parra line out lock Seva Domoni brings the ball down into a rolling maul. Each of the forwards take the ball up and lock Seva scores next to the posts after 6 phases of play. A great team try. Wing Joey converts. Half time score: Southern Districts 33, Parra 14. The half time talk was about tiding up the kicks. We are putting pressure on ourselves. I thought that was an understatement. We need to stay connected, when we make the tackle we are bouncing off and allowing them to run. Stop them!!!! Southern Districts re start the game by kicking to prop Nigel Vaifale. Nigel takes the ball forward and is penalised for not releasing. Nigel placed the ball correctly and he gets pinged. South’s don’t need any more help. South’s kick for touch on the western side line 5 metres out. South’s attack up the centre and spread to the left scoring in the Tatafu corner. The conversion is unsuccessful. Southern Districts 38, Parra 14. The restart witnesses South’s penalised for a late tackle on half Waldo. Parra fail to find touch. A coach killer, criminal! This is school boy stuff or a Wallaby like ploy. South’s run the ball and are penalised for not releasing. Parra lineout on 22 metre. Parra bring the ball down from the line out and rumble forward completing 6 phases of great rugby. South’s are again penalised for a professional foul. Somebody is going to go here! Parra take the scrum. Full back Hayden Cole takes on South’s with his elusive running. Great play! Parra are playing positively. Parra force the turn over as the South’s half drops the ball in a great attacking position left of South’s posts on the 22. South’s replace 3 players. Penalty to Parra for South’s not releasing the player. Parra lineout on the clubhouse side on South’s 22. Parra turn the ball over and South’s kick it out. Parra lineout on 30 metre on the clubhouse side. Parra are keeping the pressure on as South’s are penalised for lifting in the tackle. Parra lineout on the 5 metre on the clubhouse side. Fly half Johnny is caught. Penalty to Parra for a professional foul. The South’s flanker is yellow carded. Prop Nigel takes the ball up the middle. Parra are magnificent in support play. After 6 phases of attacking South’s line lock Seva Domomi scores his second try. Wing Joey converts. South’s 38, Parra 21 after 16 minutes of play in the second stanza. Parra are on fire as the South’s half is penalised for stealing the ball from an offside position. Parra continues to build pressure on South’s as the team holds the ball going forward for 9 phases of play. Lock Seva Domomi scores his third try backing up. A fantastic effort Seva! Wing Joey’s kick is his worst for the afternoon. The conversion is unsuccessful. South’s 38, Parra 26. Congratulation boys on the bonus point. Prop David Lolohea is penalised after getting up and running again from the tackle. Parra is coming home with a wet sail. South’s are rattled and take the penalty kick for the infringement. “The Two Blue’s Hill “razz the kicker. The South’s player misses. Well done boys! However, the miss kick is short lived. South’s attack our line from the drop out with picking and driving. Excellent work by the South’s forwards as they complete a push over try. The conversion is successful South’s 45, Parra 26 after 27 minutes of play. We need 3 converted tries to get back into the game. This quickly becomes academic as we fail to tackle and South’s score in the Tatafu corner. The conversion is unsuccessful. South’s 50, Parra 26. The boys have put in. The score doesn’t reflect Parra’s work rate with 5 minutes to go. The restart witnesses Parra kicking deep and South’s return the kick. It’s a great kick as replacement lock Sione Fifita is forced to kick the ball backwards. Sione should have gone down on the ball. The South’s centre chases through and scores. South’s covert South’s 57 Parra 26. Unbelievable! The games not over as Parra kick deep and South’s run the blind side using their replacement winger who has blistering speed and a good dummy. He scores out wide. The boys don’t deserve this. The kick is unsuccessful. Full time score Southern Districts 62, Parra 26. Congratulations to Southern Districts, they kept their foot on our throat for the full 80 minutes. Congratulations to Seva who controlled his own ball from the lineout and scored 3 tries. A man of the match performance! Bring on Penrith. It is going to be a monumental game. Penrith were just pipped by Gordon having lead for most of the game and held Gordon try less in the first half. Penrith will be looking for their first win of the season.